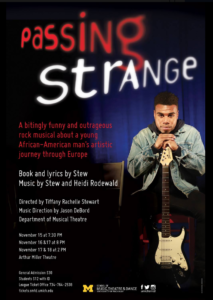 Passing Strange was a skillfully and cleverly produced musical. Not just because of its storyline, but also because of its creative choices in blocking, delegation of roles among the actors, and overall setup. At first I was somewhat puzzled by the venue. The Arthur Miller Theater is pretty small. Once the show began, I understood. And I loved it. I was particularly intrigued by the utilization of the entire theater as the stage. The audience was seated so close to the actors, it was an intimate experience. Throughout the show, actors ran up and down the aisles, and flyers rained down from the ceiling into the audience during different scenes when the storyline called for it. The production called for the use of the audience’s imagination which I really liked, especially as a writer who frequently uses metaphor and allegory. But the musical may not have been as accessible or enjoyable for audience members who enjoy more realistic blocking and representations. For example, snow looking like it’s falling from the sky/ceiling rather than supporting actors throwing snow over the main character to suggest that it’s winter. But this is a matter of personal preference. Another aspect I enjoyed of the musical was that each actor played several roles: usually a starring role and a supporting role(s) in the ensemble. I thought that was incredibly creative because I have never seen that before. The band was also integrated into the musical. It was physically set up and integrated into part of the set. And surprise, the pianist was also part of the ensemble. The cast was incredibly talented. All the actors had strong vocals, and the dance routines were incredibly energetic and entertaining. The cast was mostly people of color which I think is relatively uncommon for the entertainment industry. I appreciated that the musical did not shy away from talking about race, the act of “passing,” religion, and privilege. There were also a lot of other relatable themes applicable to the audience member’s life regardless of their age or experiences: oppression, restlessness, (an artist’s) identity, belonging, and fulfillment. What I especially liked, however, was how the musical explored the nuances of oppression and privilege. 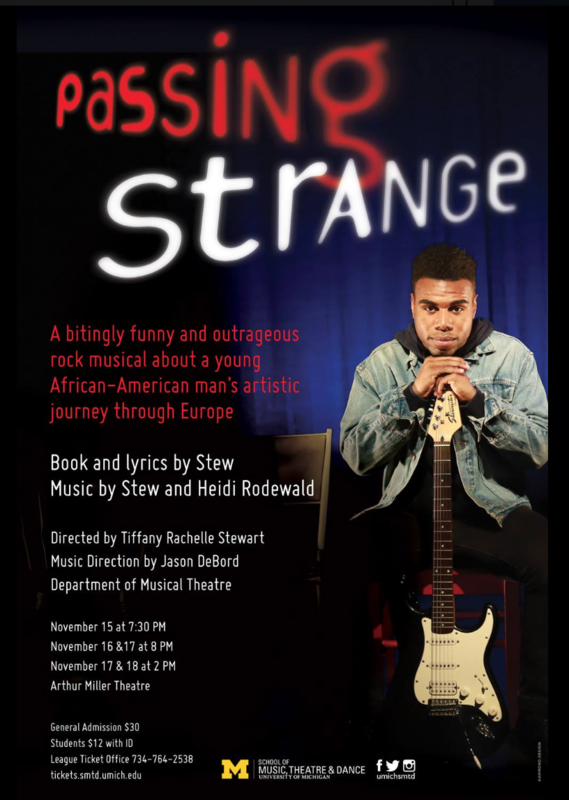 The musical recognized that yes, African-Americans face abominable oppression in America. At the same time, there are nuances worthy of exploration. As the main character ‘searched’ for his identity and belonging, he ‘passed’ as ghetto in order to gain social esteem among his peers and develop a (somewhat false) identity as an artist. When in fact, he grew up in a middle-class community. I appreciated the musical’s exploration of intersectionality of race and social class and the nuances that result from it. It reminded me of the movie Love, Simon, which was also very well done. The movie explored a situation in which the main character had a family and group of friends who were loving and accepting of the fact he was gay. But he was so anxious and paralyzed about coming out, he lied and hurt a lot of his friends to stay in the closet. Both of these works, Passing Strange and Love, Simon, examined the ‘victim identity,’ which is of course a controversial topic. But nothing, unfortunately, is simple. Overall, I really enjoyed the musical. It was thoughtfully produced, heartfelt, and it left me with a lot of ideas and themes to ponder.